I actually had the only parallel bar clamps in the UK some 6 weeks before anyone else, including the UK distributer! Whilst this is not particularly important to the story, it's still pretty cool, as good a place as anywhere to start. Piher PRL clamps alongside the familiar Uniclamp & K body. I already have a few of the "Black and Reds", so don't get me wrong, I'm not being paid to say one is better than the other, In fact I really like both. I also have 4 similar clamps I bought 6 or 7 years ago in a set, which are "OK", but not in the same league as the other two. Both have plus points, and if you were lucky enough to speak to me at W14 on the subject, hopefully you would have realised that. So let me just stick to the facts, as I see them. Slight deformation starting to appear on the older Uniklamp. Having had these in the workshop for a couple of months now, they're working great. But since I had something to directly compare them too, I thought I'd take a slightly closer look at what was what. The smaller PRL80 clamps are, in my opinion at least, a better option than their Bessey cousins. 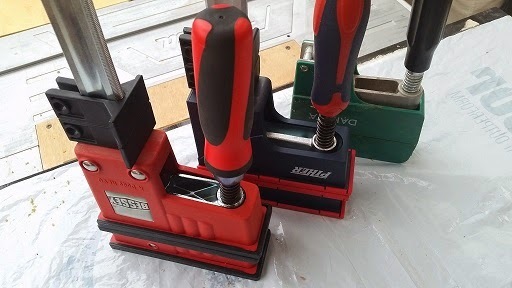 I've been told that the Bessey clamps use an aluminium alloy in the fixed and movable head whereas the Piher80 uses forged steel. both have a forged steel bar, so in time the aluminium will come off worse to that of the forged steel. On closer inspection to my own Uniklamps, I can see the start of some deformation on the head in only about 15-18 months use, occasional use at that. Having looked around the internet for other more technical information I also found that the Uniklamps are rated to 1500N or 150Kg. whereas the PRL80's are 200Kg. Line-up shows the finer differences to think about. I really like how Piher seem to have thought a little bit deeper about the inner workings. 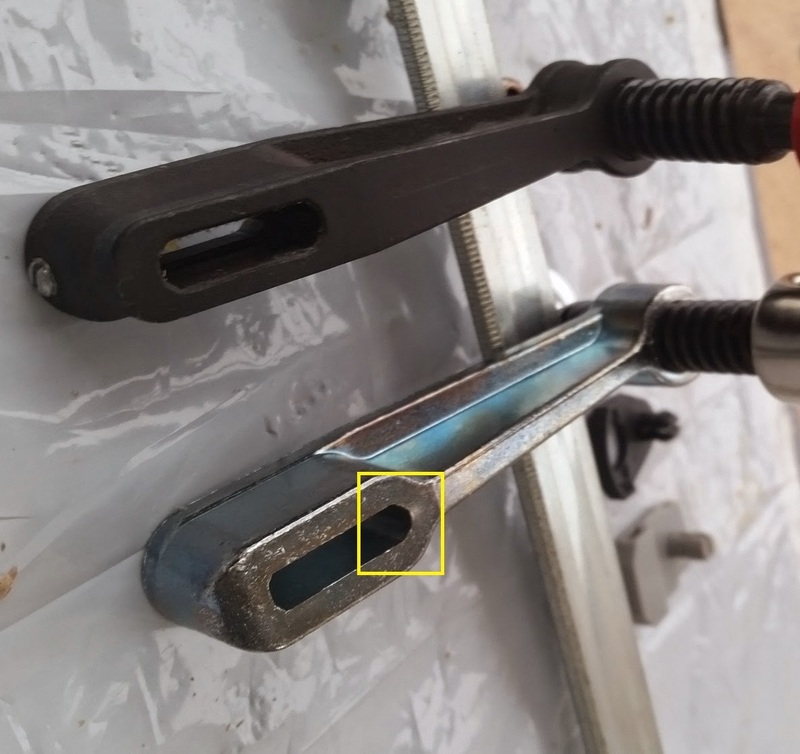 Even the fact that the forged steel head had the addition of a grubscrew which can be tightened down onto the serrated bars should it start to slip. Should you not require it for a while, (which you are unlikely to in my opinion), they've loc-tited the screw in so it's safe until the day you do. care and attention taken in hidden places. The differences in the handle can bee seen a way off, but the fact that Piher have put to steel bars in place on the end rather than the "F-Clamp" type head seem to me to be a clever change too, these are unlikely to slip or move due the the double riveted fixing, and may well be a place so save some pennies to spend in other places. When you strip the clamps apart the differences become more apparent, I couldn't get the plastic cover off the fixed head on the UniClamp, But To be honest I didn't want to break it. I'm not about to deliberately wreck a perfectly good clamp am I?!! I really like the way Piher have spent a little longer on the rotating head on the threaded bar. 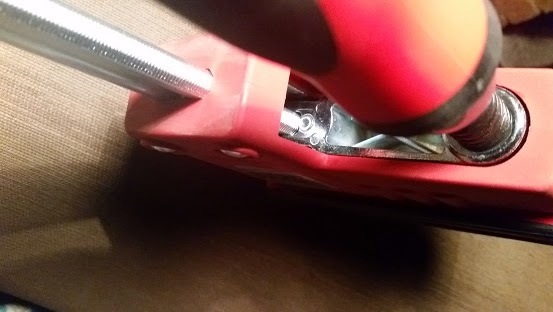 It looks like it's been tumbled at manufacture, and is then press fitted onto the end, the smoother finish means the inside of the plastic floating jaw is not chewed up or marred by the "washer". when you compare this to the Bessey the head is stamped out, and has that tell-tale burr around the edge from the press and then rivted in place. Mine are holding up, still showing signs of wear.. In summary, Both are Good clamps, and fit more the more modest budget. That said I do prefer the Piher clamps over the Bessey's and not by a little. I will definitely be replacing the UniClamps, and similar clamps with PRL80's. For those who require a little more power, and head capacity the PRL95, Bessey K Body Revo, and similar clamps are available. I also have some "Dakota" clamps which look a lot like the older PRL clamps, that have now been discontinued, (A good move in my mind, as they are not up to the standard of their other products - IMHO). There's much less available to criticise with this comparison, as although I would say the Piher clamps are still taking pole in the ratings, it's definitely a much closer race. Mainly down to the fact that these to seem to bite up quicker and more positively than my body, and that they have chosen the Forged steel head over that aluminium alloy. all the other differences are purely cosmetic to my mind. Bessy's handle is a little smoother, and as they are sold as imperial sizes, my 24" K body is a little longer than the 600mm PRL95. 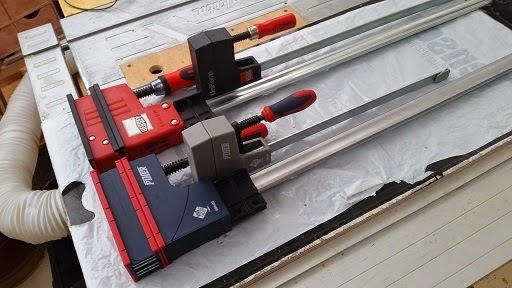 Bessey do state a 700Kg clamping force compared to Pihers 500kg, Which is worth consideration, how often am I likely to need such a force, that's telling me to tinker with the joint. Taking either of these two clamps apart seemed far more daring than I was willing to go, no point breaking them just to look inside. One thing I did notice was that the on the K body, the bar has had 6 surfaces serrated on the bar. I'm told this is to give three times the area to grip onto. But I've not been told this by Bessey, only word of mouth......I have no reason to doubt the reasoning of this as it make sense from a scientific view point, That said looking at my K body the head doesn't seem to make contact with that section of the bar?! Gap between the clamping head and the serrations on the flanks. 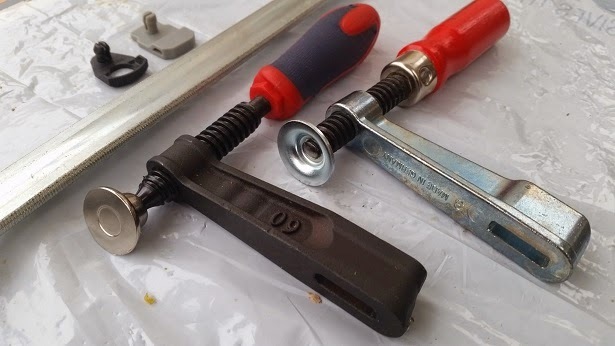 I am fully aware that there are die hard fans of Bessy clamps, and those that will look down their noses at piher "copying" or "trying to muscle in on their product". But really I don't think this the ase. yes Bessey had the Idea, Piher have just Taken it and made some improvements. Just like in any other industry someone comes in with an improvement. 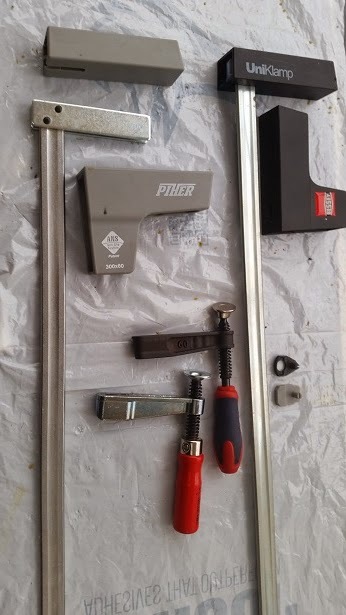 I still really like Bessey, but Personally I like the Piher range a little better. I would also be interested in hearing from you guys, who have Bessey and/or Piher clamps, and even the companies themselves to clarify or amend any of what I've said. Everything is correct to my knowledge and from what I have been able to gleen. If anything is incorrect then please do let me know, and I will gladly amend. Thanks for reading, and look forward to seeing what other things I managed to get up to with some of the other clamps!